Most of the time, anyway. Thermal receipt printers are quieter, faster and not having to worry about ribbon cartridges means fewer consumables to manage. Thermal paper is your only consumable. *Hint: Make sure you don’t confuse thermal transfer with direct thermal. Thermal transfer is sometimes used in printing labels or tags. Receipt printers are always direct thermal. Commercial kitchens are the primary remaining use of impact receipt printers. Think about it, thermal paper is heat sensitive. Characters are printed by applying heat that turns the paper black. If you used a thermal paper order ticket, the heat from the grill (assuming the order ticket is close to the grill) would turn the ticket completely black, making it illegible. The other major use of impact printers is for printing multi-part forms, like the old white-and-yellow credit card receipts. Needing to print and then sign or notate duplicate copies is still a requirement for some businesses. Multi-function printers that include functions like slip printing and check endorsement require impact printing to print on non-thermal paper, such as checks. Q: Tear bar or auto-cutter? Auto-cutter: Required for printing duplicates! Have you ever received a gift receipt during the holiday season or for a birthday gift? These receipts were sliced by an auto-cutter. An auto-cutter slices a clean edge, leaving a small portion of the receipt uncut so they are still attached (just barely). Gift receipts, multiple food tickets pouring into a kitchen or credit card receipts that need ink signatures (no electronic signature capture) also require an auto-cutter. Any time you’re printing duplicates or multiples, you need an auto-cutter. 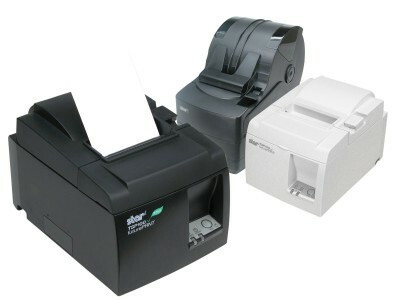 Tear bar: Many receipt printers include an auto-cutter as standard equipment, but some are still available without one. A tear bar requires you to tear the receipt from the printer with a serrated or sharp edge, leaving the receipt with a rough cut and paper dust build up in the printer. Although this option may be cheaper, you can only print one thing at a time. It’s really only an option for cash receipts or customer-only credit card receipts when the signature is captured and stored electronically. Q: What accessories are needed? A: ALWAYS and CAREFULLY check the description of the printer to see what is included. Receipt printers may or may not include a power supply and/or an interface cable. You want to be sure you are ready to go when you receive your printer. Q: Why are there SO MANY part numbers per model? All of these options add up to a lot of different configurations and each one has its own part number. Hopefully, with this information in mind, your decision process will become a bit easier. Looking for an ‘all encompassing’ starter kit? The Star TSP 143IIU has everything you need to get started. It is a dark gray USB printer with auto-cutter, USB cable to connect to your computer, a wall mount bracket, power supply and even software to enhance your receipts. The TSP 143L is a great choice if you need an Ethernet connection instead of USB. This is commonly used to when you need to connect the printer by network cable to a wireless router and then print from wireless devices like tablets. What other questions do you have on receipt printers? We’d love to hear from you. Ask us on twitter @L-TronCorp, email us, or call 800-830-9523. Elyse is a member of L-Tron’s Marketing and Content Creation Team. She is a proud RIT grad with a background in business and passion for design who found a new love for data collection. She dances to any beat, even songs in her head, and could eat breakfast food all day long.